And use the code chr1stm4s to get 20 percent off tickets. The first full entry to the series in over a decade, Spellforce 3 brings back that mixture of high fantasy and real-time strategy that has made the series so loved. You might be on the fence about it, looking forward to having a go, or not convinced—regardless, you will be able to play Spellforce 3 at the PC Gamer Weekender. Not only will we have hands-on available for the fantasy RTS title, there will also be a tournament running over the weekend. So get some practice in if you can—and if you can’t, just try to be naturally better than everyone else. It’s a technique, I guess. 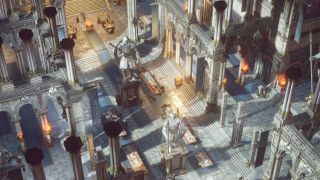 Spellforce 3 takes players back to the roots of the Spellforce saga, letting them experience war-torn times in the world of Eo and through events that lead up to a cataclysmic event predating the events of the original two games. Pre-apocalypse leading into post-apocalypse, then? Sounds like our idea of fun. For more details on the game you can check out its Facebook and Twitter pages, as well as the official Spellforce site. Spellforce 3 will be joined by many more speakers, games and booths, all at the PC Gamer Weekender, which is being held February 17-18 at the Olympia, London, in the UK. For more details see the site, and follow us on Twitter for up-to-the-minute news. Tickets are available now from £12.99, and you can get 20 percent off if you use the code chr1stm4s before January 5.